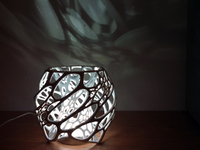 Cellular Lamp by nervoussystem is licensed under the Creative Commons - Attribution - Non-Commercial - Share Alike license. A big cellular thing. Use this as a lampshade for an LED light or as a sculpture. Many people have printed the bracelets I uploaded so I decided to give you something bigger. 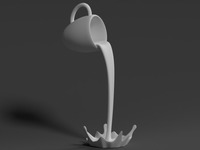 I've uploaded a new version (cellularThing_optimizedForMakerbot.stl) that is optimized for a MakerBot Replicator. The bottom of the model is sliced off to make it completely flat, the thinnest members of the structure have been thickened. 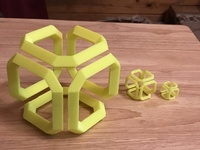 Say thanks by giving nervoussystem a tip and help them continue to share amazing Things with the Thingiverse community.